"Clever Mutt™ has been very informative and patient during this entire experience of designing a website to suit our needs. We here at The Escape in Athens Texas want to thank you for such a great job!"" 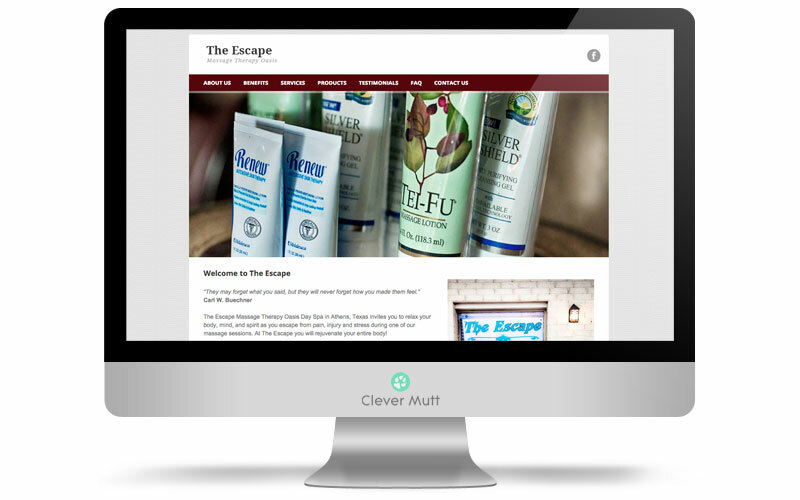 The Escape Massage hired Clever Mutt™ to provide onsite commercial photography and a new mobile responsive & website powered by the Clever Mutt™ Portal web content management system complete with albums, galleries, blog and other essential features. The Escape Massage Therapy Oasis Day Spa in Athens, Texas invites you to relax your body, mind, and spirit as you escape from pain, injury and stress during one of our massage sessions. At The Escape you will rejuvenate your entire body!.